Grass-fed beef is leaner than grain-fed. Because of this, it does not have a lot of spare fat to keep it moist when cooked too long, or at temperatures that are too high. Fatty grain-fed beef is sometimes more forgiving, and grass-fed cuts need a little extra attention and care. Grass-fed beef takes on average about 30 percent less cooking time, and is most tender when cooked medium-rare or medium. We suggest you watch the internal temperature with a meat thermometer. 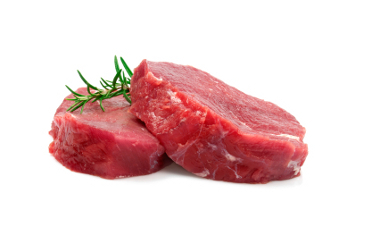 Ideal temperature is generally between 145°F and 155°F for medium-rare to medium. Anything above that may cause your steak to lose its moisture and tenderness. If you like your steak well-done, we suggest you opt for a cooking method that utilizes a lot of moisture to keep the meat tender. Although in our experience, even a medium-well cooked grass fed steak is tasty, unless it is charred or cooked unevenly. Do not cook when frozen or partially frozen. Refrigerator - You can usually defrost steaks or a ground beef package in about 24 hours; roasts and bone-in cuts can take up to 3 days, depending on size. Place the beef on a tray or in a container to catch the juices. Cold Water Immersion - On the day you want to cook, you can thaw any beef cut by submerging it, still in the packaging, in cold water in 1-3 hours. Refresh the water every 30 minutes or so to expedite thawing. There are two main ways of cooking meat: dry heat and moist heat methods. Dry heat - cooking methods include sautéing, grilling, and roasting. Grass-fed beef can be cooked with any kind of dry heat method, as long as you are extra careful not to overcook it. When cooking grass-fed beef with dry-heat methods, make sure to always sear the beef over high heat, then continue cooking it at a lower temperature either in a pan, on the grill or in the oven, depending on the method you're using and the recipe. Moist heat - cooking methods include braising, stewing. Braising and stewing are wonderful ways of slow-cooking meat in a lot of juices, including stocks and wine, making it exquisitely tender and full of flavor. Ever wondered why people refer to “meat that falls off the bone”? Try braising and you'll experience it first hand. 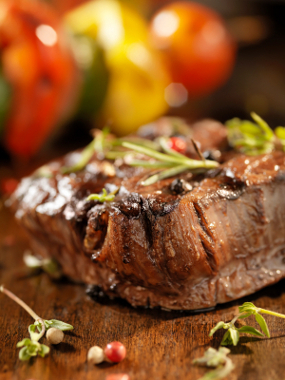 Any kind of grass-fed beef can be easily braised or stewed without any risk of moisture loss and dried out meat. Braising and slow cooking are especially helpful for tougher bits of meat, such as chuck, blade, stewing meat, or brisket. As a rule, always let any type of meat rest for 8 to 10 minutes after taking it out of the heat. This will help redistribute the juices inside the meat before serving. In particular, when you're planning to serve the meat in pieces, don't cut into it right away because the juices will immediately spill out, resulting in a drier texture. For the same reason, always turn your meat with tongs rather than a fork when cooking it. Precious juices will be lost if you poke the meat. Tip: Grass fed hamburger is generally about 90% lean. Some people like to add caramelized onions or other moisturizing ingredients to compensate for the leaner meat, although we prefer our grass-fed hamburgers just the way they are. We usually press our hamburgers with hand held hamburger press to help them hold together better.